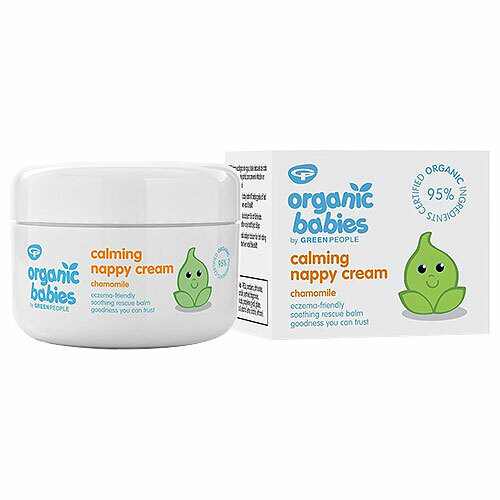 This Calming Nappy Cream from Green People is a soothing organic bottom balm which protects against dampness when your baby has nappy rash. Enriched with Roman Chamomile and Calendula to soothe and restore baby`s delicate skin. Suitable for delicate skin and babies who may be prone to eczema and psoriasis. This natural baby product is made without parabens, lanolin, phthalates, artificial perfumes, petrochemicals and colourants to bring you the purest baby balm that nature can offer. Elaeis Guineensis Oil*^, Helianthus Annuus Seed Oil*, Cera Alba*, Zinc Oxide, Cannabis Sativa Seed Oil*, Butyrospermum Parkii Butter, Lecithin*, Calendula Officinalis Flower Extract*, Aroma [Anthemis Nobilis Flower Oil*^], Tocopherol, Geraniol*, Citronellol*, Limonene*, Linalool*. Apply sparingly to freshly washed and dried skin. Re-apply as often as necessary, and at each nappy change. Use clean fingers to remove cream from the pot to prevent bacteria building in the pot. Always replace the lid to keep water and airborne germs out. Below are reviews of Green People Organic Babies - Calming Nappy Cream - 50ml by bodykind customers. If you have tried this product we'd love to hear what you think so please leave a review.